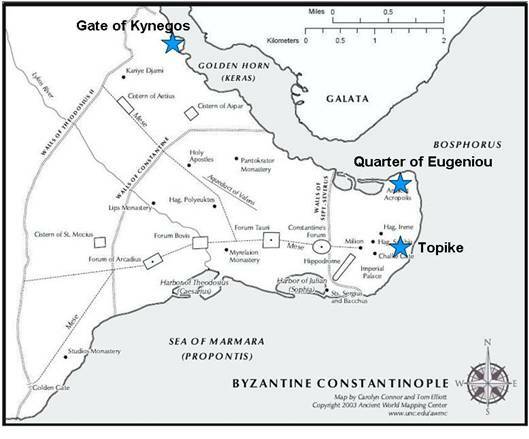 In the beginning of Chapter IV Syropoulos describes the beginning of the travel of the Byzantine delegation from Constantinople to Venice and refers to three areas in the city of Constantinople: the quarter of Eugeniou, where one of the ships anchored in order for the Patriarch to board on it, the area of Kynegou where the ships anchored the following day so the Emperor would board and Topike where the ships stopped and final preparations for the journey took place. In the quarter of Eugeniou there was the gate and the tower of Eugeniou which formed part of the maritime walls and fortifications along the Gold Horn (Janin 1950, 325). The quarter of Kynegou is situated in Blachernai, close to the palace and the church of Blachernai. Its name is associated with one of the favourite activities of the Constantinopolitan court, hunting. The Emperor must have embarked on the ships in the Neorion of Kynegou, the embarking and disembarking point for the Emperors and high officials in the time of the Palaiologoi (Janin 1950, 269-70). Finally, the area of Topike, also known as Topoi, (places) is situated on the coast of the Propontis close to the palace and monastery of Manganes (Janin 1950, 278-9, 398-9).